My Genesis 7.1p speakers came in the Arctic Silver bodies with the Metallic Slate Grey Shields. This is a very modern looking speaker that really fit well in my upstairs system in a room with black and red modern furniture. It has a very nice finish and looks simple but stylish. The G7p is a fully sealed, simple two-way design with rigid, well-braced construction that prevents the speaker cabinet from resonating, and it passes the knuckle-rap test very well. In general, I find sealed cabinets to have more accurate bass, although not as much output as a simple, ported design. The G7p uses a 1.5″ thick front baffle made from two separate pieces of high-density MDF. The outer piece or shield is slightly curved to reduce diffraction and gives the speaker a more appealing appearance. 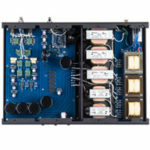 The tweeter is Genesis’ proprietary and renowned circular ribbon tweeter that utilizes a Kapton membrane that is only 0.0005-inch thick. It has a photo-etched voice coil and the combination is almost lighter than the air it is moving. It can produce frequencies all the way out to 36kHz. There are two such tweeters on the G7p, one on the front and one on the rear. The rear tweeter can be turned on or off. The mid-bass driver, according to Genesis, is the world’s first solid titanium-cone mid-woofer. The Titanium cone is both very light and very rigid. The mid/bass driver also has a BASS CONTOUR control on the back of the cabinet to help adjust it to your room and placement. A rather rare feature of the Genesis 7.1P is that it has five-way binding post for both input and outputs so that you can easily hook up a subwoofer. Don’t mistake this for a pair of inputs meant for bi-wiring. One of the great things about the little Genesis speaker is the wide range of amps you can use. Even though I didn’t have it on hand at the time, I am sure the $3500 Genesis I 60 Integrated Amp that I reviewed earlier would sound great with these speakers. I did have on hand the $2,595 Roksan Caspian M-Series 1 integrated amplifier, and the G7p’s really sang with this amp. As good as they sound with the Roksan, they sound even more incredible with the Shindo preamp and the Monarchy Audio SE250 mono amps, and they sounded better still than I would have ever imagined with my Wavac EC300B, though they really need just a little more current. Even so, this is the way I liked the Genesis most. It is not such an easy task to design a speaker that sounds this good with this wide a range of amps. For example, my reference speakers the WGA Ikonoklast Model 3’s are my second favorite speaker I have ever heard (the best being the Shindo Latour’s that cost better than $40K) when used with the Wavac or other great tube amps, but does not like either of the above solid-state amps. The Genesis 7.1p is an extremely fast speaker with good transparency, It is capable of sounding nimble and quick. It has toe-tapping dynamics, and it has very nice sweetness and air in the upper frequencies and this makes it easy to hear the differences in instruments from recording to recording. From the midrange on up through the top-end, the G7p’s are as fast and transparent as speakers that cost twice as much. 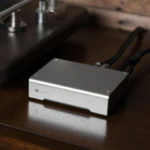 The use of a conventional dynamic midrange driver with this tweeter could have been a mistake, but the new titanium midrange/bass driver seems to be the tweeter’s equal in speed and transparency. On most music, there was an exceptional sense of coherency. Because of its transparency, the Genesis 7.1p’s top-end could’ve been very revealing, yet I find it easy to enjoy and listen to. It never sounds overly etched or in-your-face. You can hear low-level details like a singer’s breath or a soft sigh; you can hear the fingers on the strings of a guitar, but you will not find that they are so detailed that it becomes distracting from the music itself. This transparency of the G7p, combined with its speed, enables it to navigate most performances nimbly and with dynamic quickness. The G7p can differentiate between subtle variations in levels moving from quiet passages to very loud with ease. It can also handles those loud, louder, and loudest passages with very little compression. This speaker is indeed transparent, fast, and dynamic, especially when you crank it up. It has remarkable dynamics for a speaker this size, and yet it still sounds relaxed and easy to listen to. I should mention though that it does not come to life at nearly quite a level as the Teresonic or Ikonoklast speakers do. One of the biggest problems with having such a fast and transparent ribbon tweeter is finding a dynamic midrange driver that will match with it in a coherent manner. Genesis’s titanium mid/bass driver easily equals the tweeter’s speed and transparency. I was surprised how very coherent a speaker the G7p is for a speaker that uses a crossover. I found the bass to go down to about 50Hz, and it was fast, nimble, accurate, and natural. These qualities allow the bass transients in the lower range to have detail similar to live music. As good as the quality of the bass is, it can’t be overlooked that they don’t go as deep or move as much air as large speakers. The Genesis 7.1p’s are more suited for a small room or to be mated to a very good subwoofer. As you listen, you will come to appreciate how remarkable the bass and mid-bass they have. Without a sub, the bass has a little less visceral power than I am use to, but this doesn’t bother me very often. I was very surprised at the degree of refined detail you can hear from a speaker at this price point. The ribbon tweeters are really something quite special at any price. The Genesis speaker’s midrange, on the other hand, has a nice sense of immediacy with an abundance of inner detail. They are not as immediate as the Teresonic Magus, but much more so than the B&W 805S speakers (next Flight of fhe Minimonitors installment). For many listeners, this will be just the right amount of immediacy. Properly set up, the G7p allow voices to sound very natural. There was no evidence of a nasal tone or over emphasis of sibilance even with the exceptional speed of the tweeter. After setting up the new Benz Ebony TX moving coil cartridge on my Clearaudio Ambient turntable, I was amazed at just how wonderful the midrange of these speakers could sound. They play music with real delicacy and yet with nice shimmer also. Because of the speed of both drivers, they allow you to hear micro-dynamics in a way that could only be called world class. The sound of strings on these speakers is just beautiful. They are so sweet and extended they sound very lifelike. It doesn’t matter whether the strings are plucked, bowed, or strung, they all sound natural and beautiful. They also have clean and tight enough bass to allow cellos and basses to have good natural warmth, but never to sound boomy. Voices also sound really nice. They have a nice combination of articulation and relaxation at the same time. To put it another way, voices sound clear and clean, but never strained. Voices are at the heart of much of the music I listen to, and the Genesis allowed me to really enjoy that music. On each of the mini-monitors, I’ve been listening to Alison Krauss; Patricia Barber; and Peter, Paul and Mary to evaluate voices. The Genesis, when playing Alison Krauss, had the ability to let me hear the harmony and the interplay of the voices. When I listened to Patricia Barber recordings, I was quite pleased with how realistic her voice could sound. With the live recording of Peter, Paul, and Mary at Carnegie Hall, you hear the air around the coughs, whispers, and giggles. The voices are placed in their own space and are not at all disembodied. The voices seem very much to belong to human beings; a quality that I really appreciate. The G7p has a wonderfully natural sweetness and air in the upper frequencies. It’s easy to hear the differences between strings or even snares from one recording to another. I found the tonal balance of flutes, violins, and other instruments in this upper range to be just right. There is nice air and shimmer in the top-end. Yet, they never bring attention to the treble. I also think that the extended top-end is probably one of the reasons these speakers image and soundstage so incredibly. It seems to me that those aural clues in the upper frequencies help us to perceive the soundstage we enjoy so much when listening to stereo. Overall, the high frequencies of the G7p speakers are quite remarkable and just unbelievable for a speaker at this price point. Imaging specificity was exceptional, even compared with speakers in this review series that cost three times as much. The speaker has the ability to separate out the vocals from the music in a way that gives them all their own space. Its ability to separate out the soloist from the instruments in a three-dimensional way was really quite captivating. The G7p produce a very nice wide and deep soundstage, and when position near spots where the rear tweeter could be turned on, they produced a lot of ambience and allowed you to hear a lot of the room or hall the music was recorded in. I found their ability to image and produce a soundstage to be one of their most engaging characteristics. This is the third review in my “Flight of Mini-monitors” series as our esteemed editor has called it. I started with Teresonic’s brand new speaker, the Magus, which uses a single Lowther driver, then the incredible GamuT L3. I am currently also listening to the newest versions of the B & W 805S, as well as my Ikonoklast model 3’s and the Teresonic Integrum. Both the Magus, the Integrum, and the Ikonoklast are crossover-less designs, but the Ikonoklast uses two drivers instead of a single driver. The GamuT L3, the Genesis, and the B & W are two ways. It should be noted that the Genesis is a sealed box speaker, not ported like the GamuT and B & W. The Genesis is the best buy of the bunch. There are things each of the others does better, but only for much more money. The GamuT has a more refined sound, and a wider and deeper soundstage, but the Genesis is very close and is faster and has a quicker, tighter bass. The Magus is a great example of what I mean when I say a speaker can sometimes sound like real music. It is better in the areas of Pace, Rhythm, and Timing. In short, they are just more alive sounding, but the Genesis come closer than the GamuT or the B&W in these areas. In my last review I said, “The choice between the GamuT L3 and the Teresonic Magus will be based on one’s taste in audio systems and not price, even though there is a $2,000 difference in price. I think most people would like one of the other, because they are both superb examples of achieving their different design goals.” With the Genesis 7.1P being half the price of the Magus and $4,000 less than the GamuT L3, money surely comes into the picture. If money was no issue, one might choose one of the other two based on personal taste, but if you had rather put your money into better amplification or front-end equipment, the Genesis speakers give you those options and a great sounding speaker. The Genesis 7.1p speakers are a rare bargain in the high-end world. They are well engineered speakers that make very musical use of some very high tech drivers to become that rare bargain. They let the listener enjoy a lifelike musical experience with a variety of amps and all for a real world price. The Genesis 7.1p is both a high-end and a real world mini-monitor. It has a real high-end sound, but has flexibility through its controls that makes it possible for this speaker to sound excellent in different locations and for different purposes. 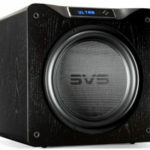 It’s a real world speaker for music lovers who want to put together a great system for under $5,000. It is also a great choice for an audiophile who wants to pair them with great tube amps, preamps, and even a good vinyl system. Later on, you can add a good sub and have a great high-end system. I say it one last time, they are a real bargain in the high-end speaker world. Thank you, that is a wonderful review. I am glad that Jack liked the G7p’s. To be beaten only by a single driver, crossoverless design that is twice the price of the G7p in the area of Pace, Rhythm and Timing is testimony to the excellence of the new designs coming out of Genesis. We spent hundreds of hours of listening during the final design tweaking the crossover and picking components to achieve this coherence. 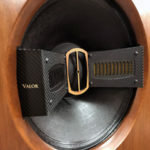 It is no surprise that Jack liked the G7p best on his $24k Wavac EC-300B, but also enjoyed it on the $2,595 Roksan Caspian. One of the design goals was for the G7p to be useable with ALL amplification. My reference amplifiers during the design ranged from the $100k FM Acoustics to the $4k Genesis M60 monoblocks, to a $300 Rotel, to a $39 Sonic Impact T-amp!! The G7p is good enough to show you how good your front end is – all the way to the top. Again, thanks to Jack for an extremely comprehensive review that took the G7p through its paces. I think that he’s covered it all.